Hand In Hand: Let's Talk About Diamond Rings! Let's Talk About Diamond Rings! I have been feeling under the weather lately and therefore haven't felt much like blogging. My weekend pretty much consisted of an embarassing amount of time spent in front of my TV watching things off of Netflix and reading my book but I did manage to go out to dinner with Kelli on Saturday for my birthday! I'm pretty pissed that while my car was parked in our parking spot at our apartment complex, this girl with a big white truck that parks next to us hit my car. I'm talking major paint scrapped off, people! So, along with not feeling well and stressing about the house and job stuff, we are having to deal with that. I'm just going to leave it at that because my weekend is really not worth talking about anymore! One thing worth mentioning, though, is something that Kelli and I were talking about at dinner. Out of curiosity, I asked her what kind of engagement ring she would want someday. She showed me some pictures on her phone of rings she might like and that got me thinking about why one girl would like a diamond ring with tiny diamonds all around the band, and another one would like the simple solitaire rings. I personally really like the solitaire rings. Something about them is so elegant and beautiful. How about a 10 Carat Diamond Ring? I know, I know, that's a little too much bling-bling! Some women like their rings to have a gem on it. I wouldn't want an engagement ring with a gem on it simply because it wouldn't match everything! But I do love rings like that! Michael got me a ring like that for our anniversary/ Valentines Day last year. Did you know there are black diamonds too? Not sure how I feel about that...as long as it's not an engagment ring I suppose it's alright. Of course I love the 3 tier rings (which is what I have). I like how it symbolizes the past, present, and future. A friend of mine has a ring with three diamonds in it and one of the diamonds is actually from a ring her brother gave her for her high school graduation before he passed away. She took the diamond from that ring and put it as a part of her engagement ring. I think that is such a sweet idea to have a part of him with her like that. What kinds of rings do you love or hate? If you have an engagment ring, what does it look like? i literaly teared up, when you talked about your friends ring! That is sooo beautiful! I want either a three tier or just a solitare! I think simple is better! Its true there are so many different opinions on rings. Mine change all the time... I like solitaire and the 3 tier always though. My dream engagement ring tho is a diamond shaped rose. I decided on this because of a rose ring I got. It looks perfect on my finger and is unique but would still match with everything. I have a three tier too. I love that it's kind of different and not everyone has it! My wedding ring had a marquee cut for the main, 3 baguettes that fanned out from either side and a channel of rounds on top and bottom. It got stolen off a delivery truck when it was out for repair. :( They replaced it of course. It is a marquee also, but bigger and channeling on top and bottom. It's very beautiful, but I am allergic to the gold or something because it gives me hives. I want a silver one now. 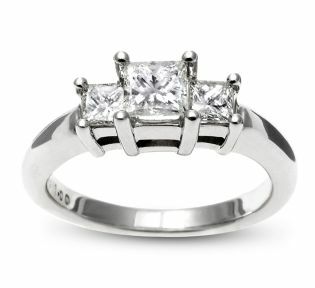 i always thought i wanted a solitaire ring until i went and tried some on. then i decided i wanted something more sparkly (which is exactly what i got!) and the center stone of my ring was the stone from his grandmothers engagement ring! My Mr and I were talking about rings not that long ago. I am one of those girls who would rather a sapphire than a diamond for an engagement ring. I want something that still looks classic but it's typical. And hey, if it worked for Princess Diana it works for me! I hope you feel better soon lady! I had a three stone ring...it was lost/stolen 5 yrs ago when our house was for sale. It either got lost/stolen at the house or somewhere in my work van. I discovered it missing at 12 midnight while I was trying to buy a postage stamp. I kept it in the coin part of my wallet and it was not there. I love rings. I have my wedding band still, but it doesn't look right without the other ring. If I had to do it all over again, I would get one ring.